1 Make the marinade: combine the mirin, mustard, sugar and saké (if using) in a shallow dish. Add the steaks, cover and marinate in the fridge for 3-4 hours. 2. Bring the steaks to room temperature before cooking. 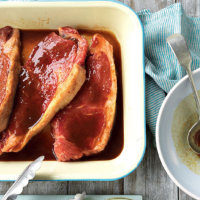 Using kitchen paper, wipe the marinade from each steak and brush with the sunflower oil. Sear on a hot barbecue or griddle pan for 3 minutes on each side for rare. Rest for 5 minutes. 3. Combine the mayonnaise and wasabi. Serve with the steaks and a salad. Your best bet is a smooth, peppery shiraz. Yalumba Organic Shiraz 2010, South Australia.